Back in the Saddle, Er, Boat. It’s been an odd few weeks. After the trailer tire went out on us at the end of May, we both couldn’t do much fishing, and couldn’t find a way to replace the tire. It sat in the driveway and we parked around it weird and tried to occupy ourselves. I’ve covered how we moved the busted trailer, got the Bagster out, and painted the camper. There was some further shuffling, which I’ll cover in detail tomorrow. But we got the trailer the Ditch Boat was on out from under it. While I was gone in Illinois visiting my mom, dad, sister, and meeting my nephew for the first time, Matt got the little boat onto that trailer. It looks a little goofy, as the trailer’s too big for the boat to say the least. 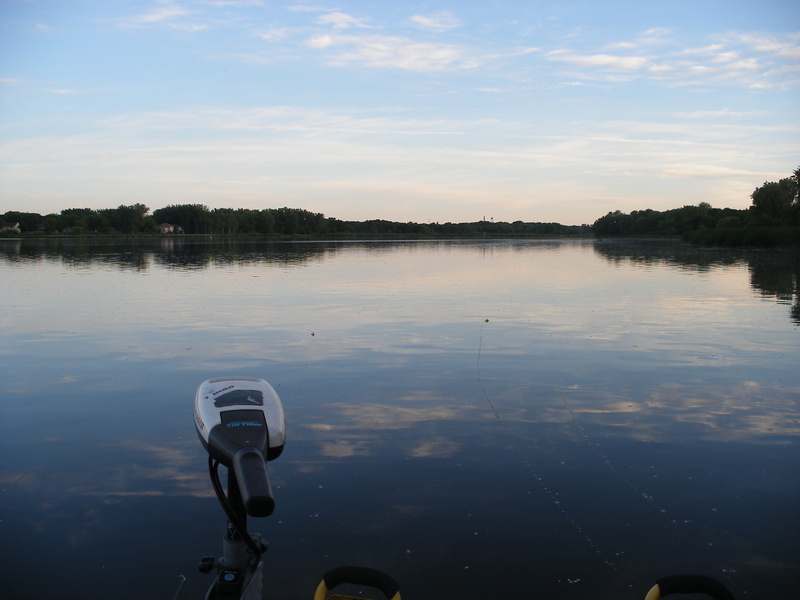 I got home yesterday evening, and we finally went out fishing. There’s still something up with the gas motor, sadly. We couldn’t have everything go right, I suppose. But we headed back out to Cherokee Marsh. It was a nice, warm night, even if there were a lot of bugs. It was a really good night out. I wish we’d brought the video cameras. The catfish are spawning, we think. 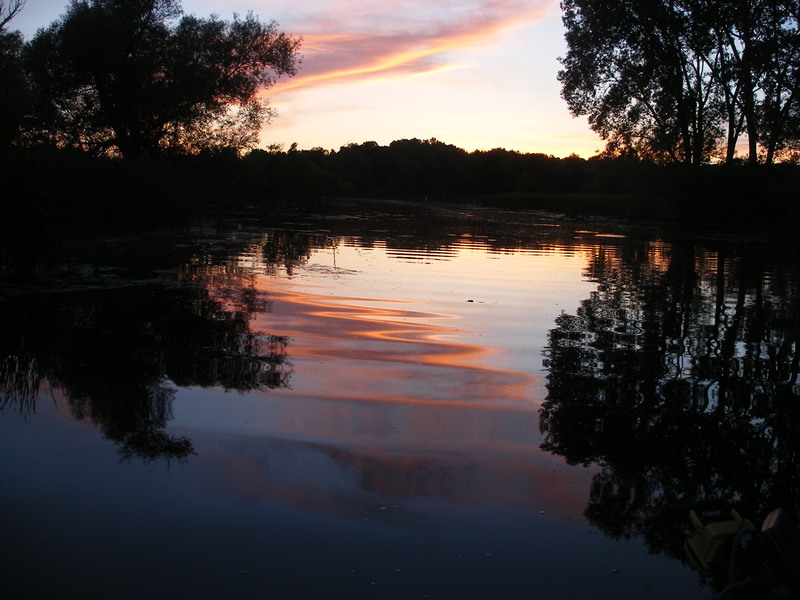 They were leaping clear out of the water, and thrashing around in the shallows and mud near the cattails on the bank. 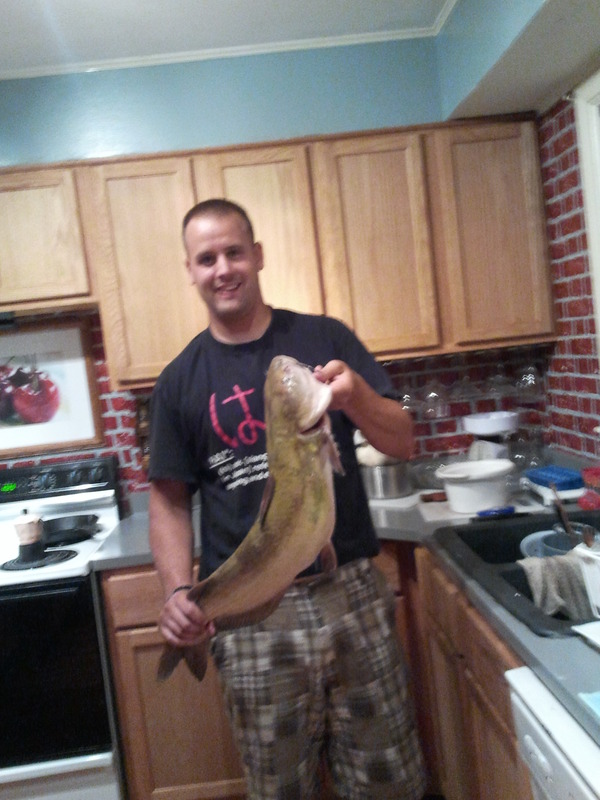 I hooked into another really big cat. It was around 14 pounds once we got it home and weighed it. I fought that thing for about 15 or 20 minutes. 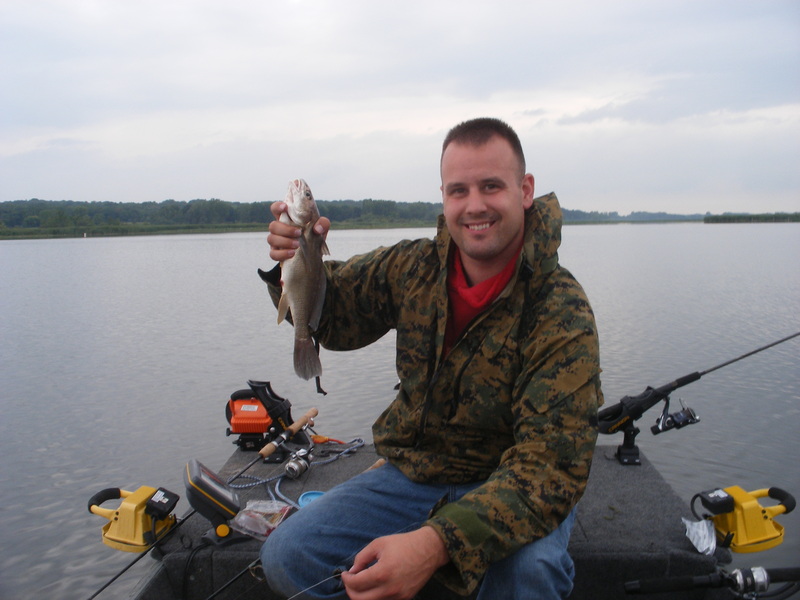 Matt had a medium sized cat on the line, until it wrapped around an anchor line and escaped. 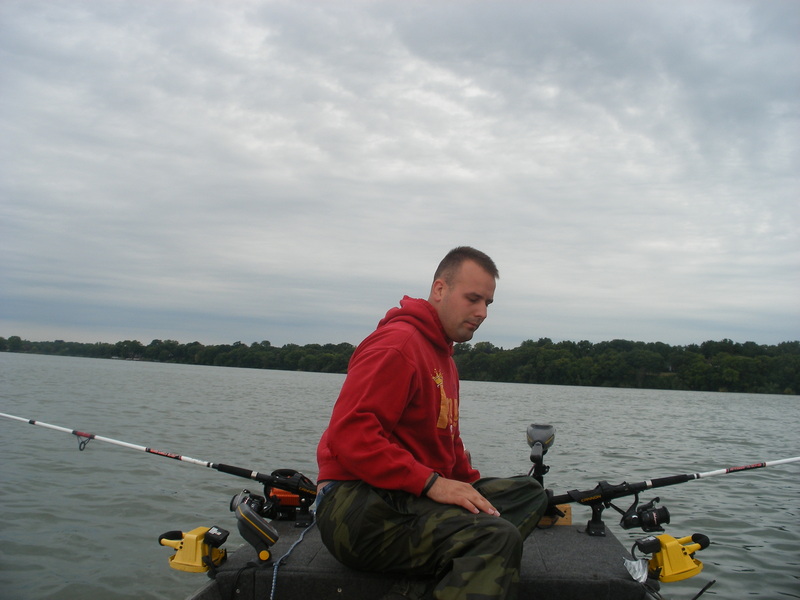 He had another probable catfish on the rod he set up for panfish- it only had two pound test on it, and the fish snapped it and ran. We had plenty of bites where the fish took the bait but dropped the hook. Matt also got his first snapping turtle. One of my bobbers went under. It was a line with a small sucker on it. 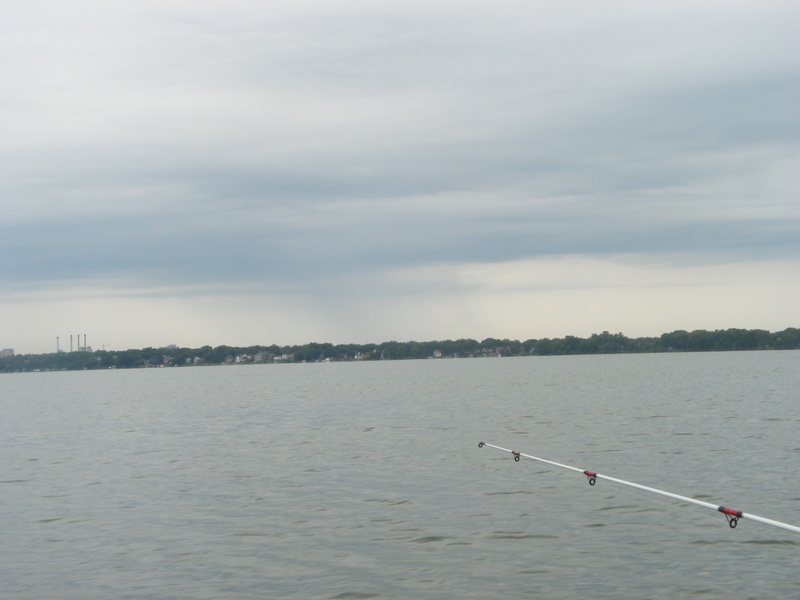 I started to reel it in, but it felt different and heavy, so I handed it over to Matt, while I got the big net ready. He thought I had managed to hook a submerged log. He got it up near the boat, still thinking it was a log. I scooped under it with a net and it was a good sized snapper; about 14 inches of shell, ugly, and angry hissing. 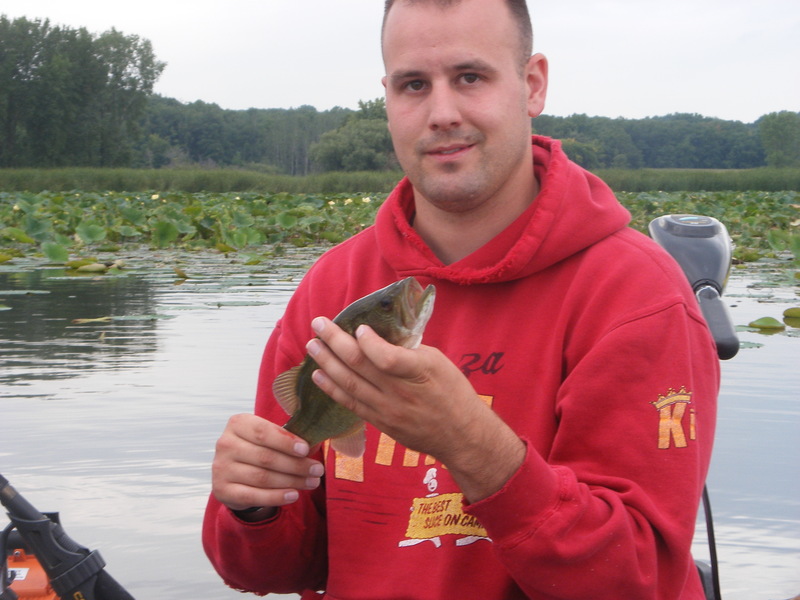 It wasn’t even hooked, it had just clamped down on the bait fish so hard we were able to get it out of the water. It dropped the bait and hook once we lifted it out. 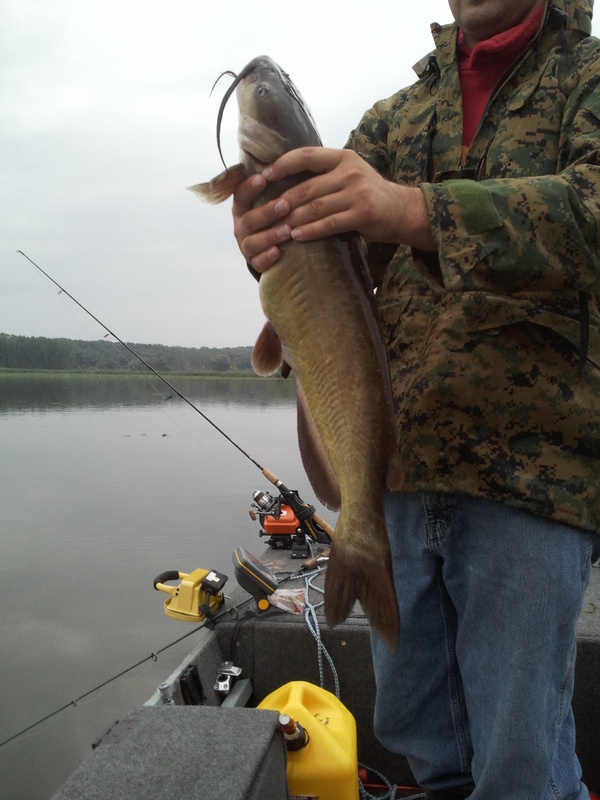 It bent our heavy muskie net. We looked the turtle over in the net before releasing him. 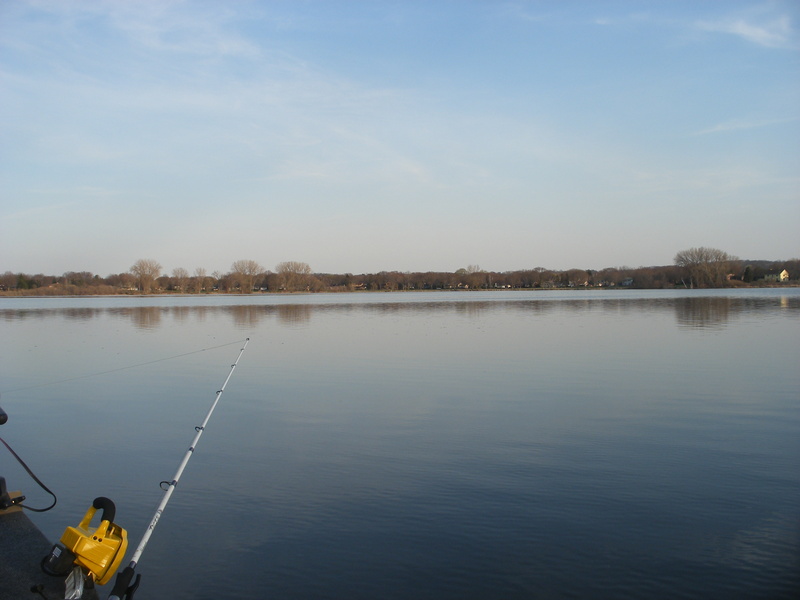 Turtle season doesn’t open in Wisconsin until July 15th. Any time I’d hooked a snapper before this, I’d either cut my line, or it had released the bait. Matt had never caught one. Once we got home, we cleaned my catfish, and began to search up and down for instructions on cleaning snappers. 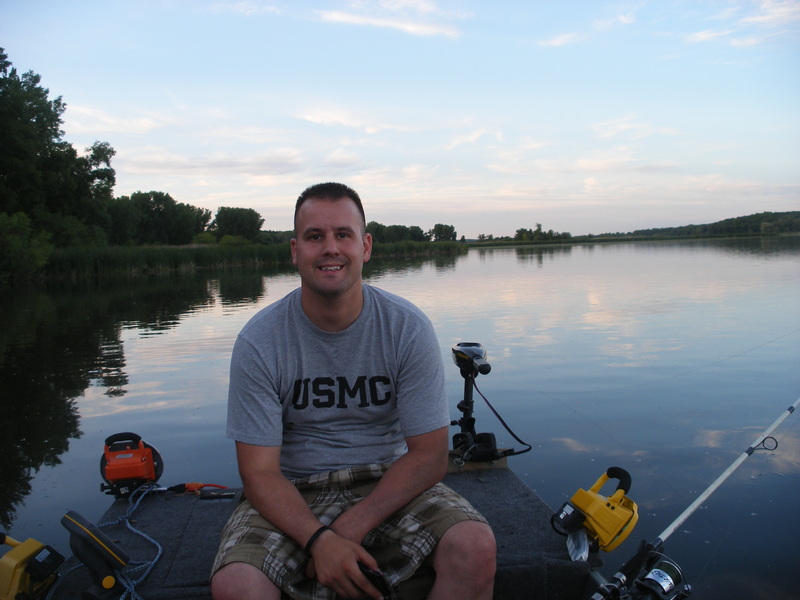 Last year, Matt discovered the joys of fishing for catfish. 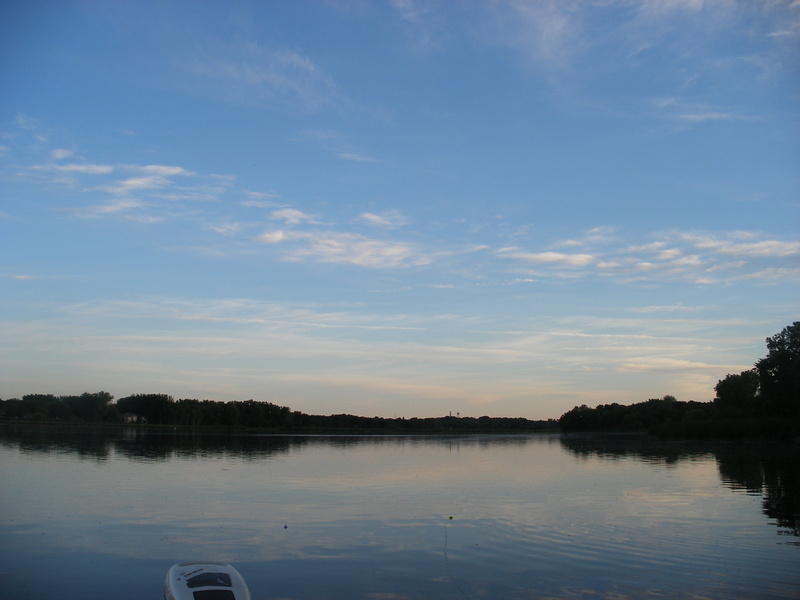 We didn’t go noodling or anything, but some coworkers of mine recommended a nearby marsh/lake for this activity. One of them had landed a 35 pound cat. 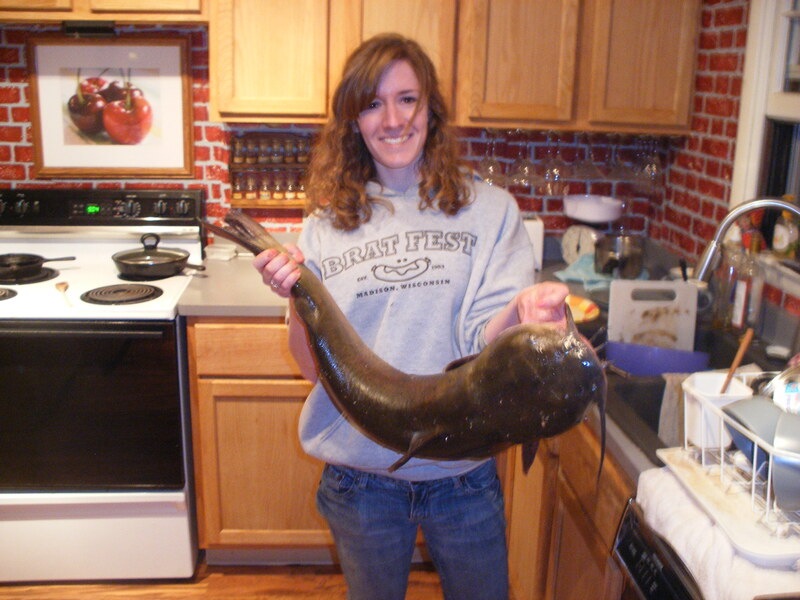 I’d fished for catfish before when I was younger, and people back by home regularly pulled large channel catfish out of the Vermilion and Illinois rivers (some up to 6 feet in length). They put up a terrific fight, and I like them deep fried myself. 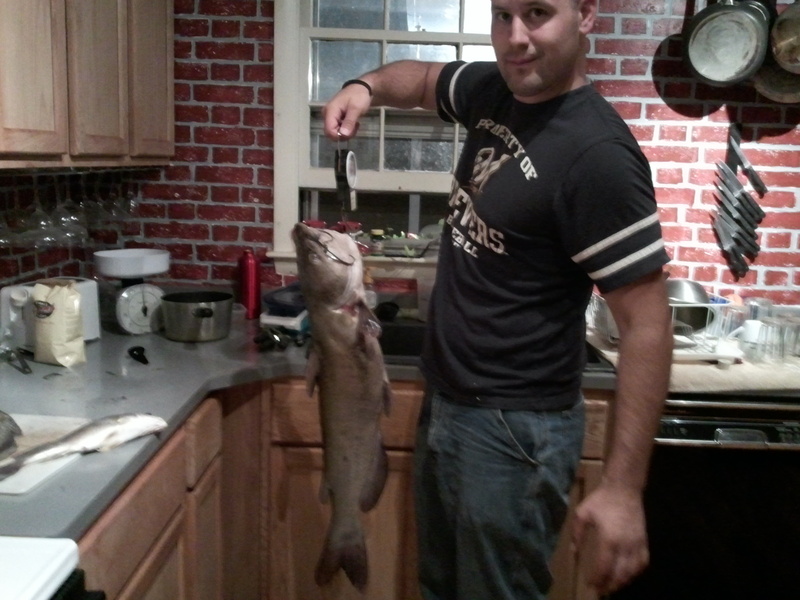 One night we each caught a big catfish. I’m not sure whether this was mine or Matt’s, but they were both around 20 lbs. 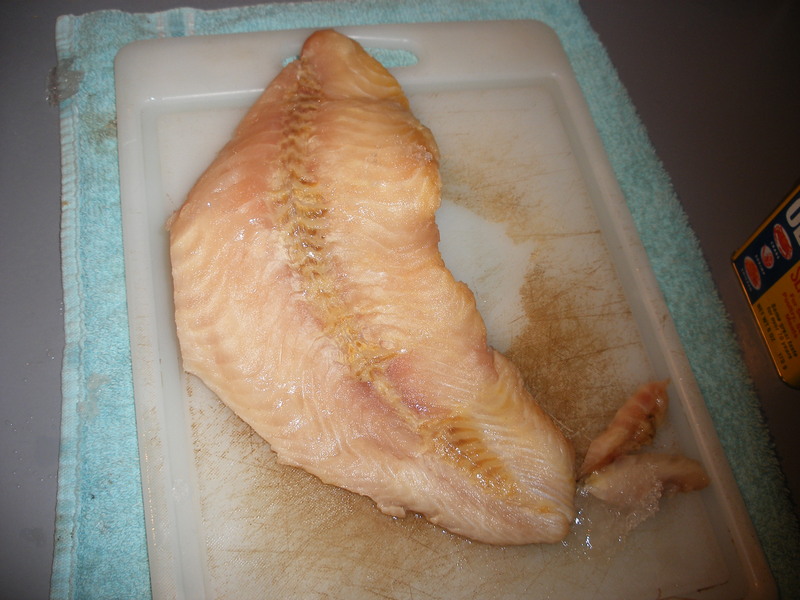 We filleted them up, and stuck them in the freezer. 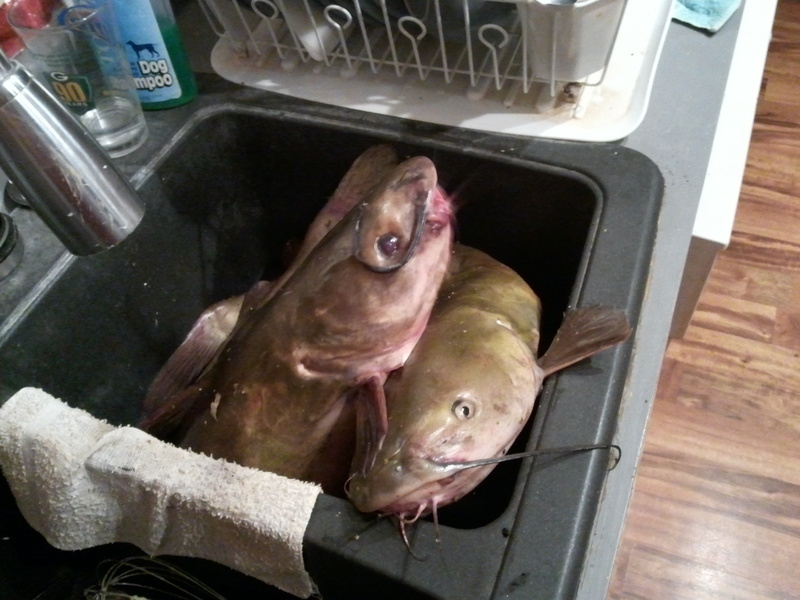 Where else would you put catfish but the sink? I cut this one into strips. I season my deep fried things under the batter. These got a quick rubdown with Old Bay, lemon juice, and some garlic. It requires getting your hands dirty, but I clean animals on the regular, and once made brioche without a stand mixer. I’m fine with it. 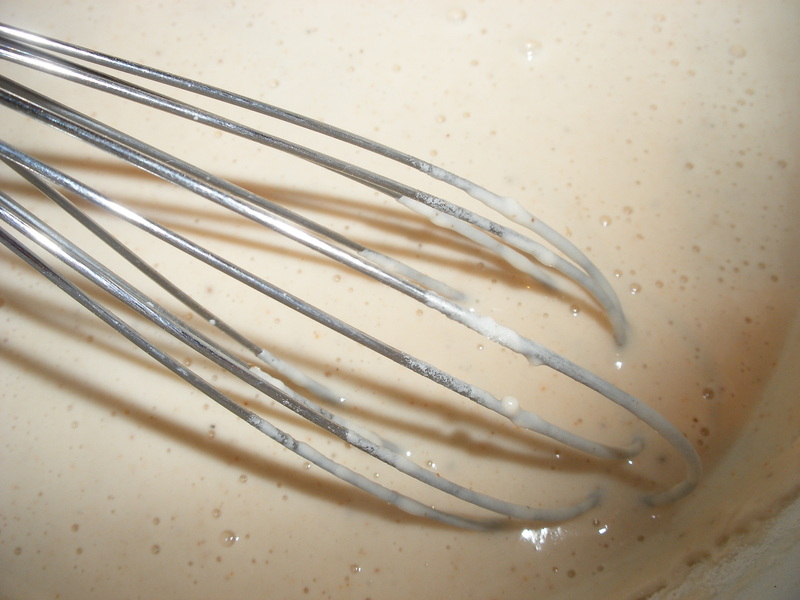 Then I mixed up the batter. This being Wisconsin, we’ve always got beer on hand. Matt has a penchant for old man beer, so Pabst it was. 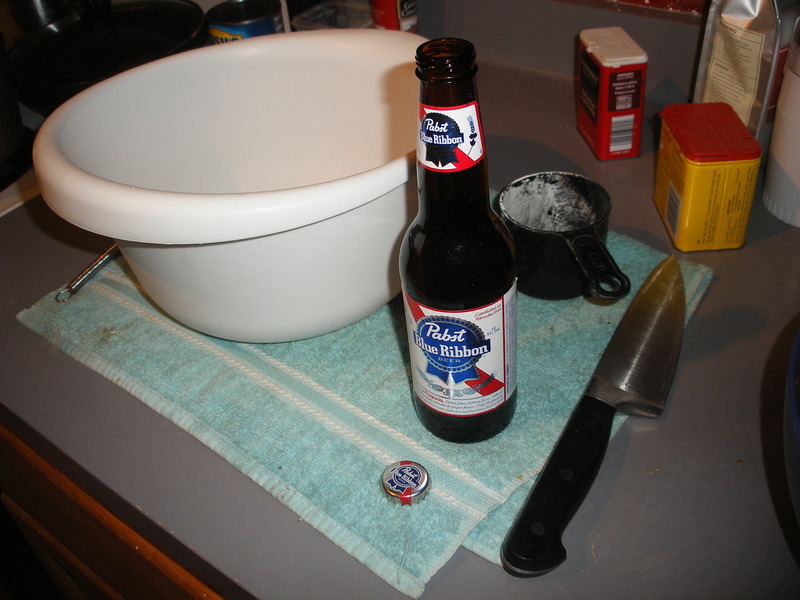 I mixed a bottle of room temp PBR with about a cup and a half of flour. 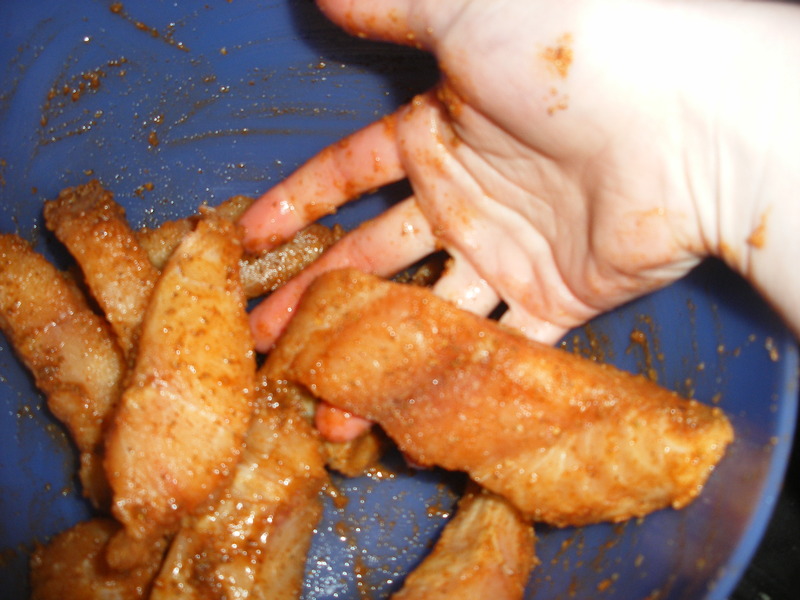 I shook in a little pepper and Old Bay for good measure, and stirred it up. I go for slightly thinner than pancake batter. Then I put the oil on to heat. 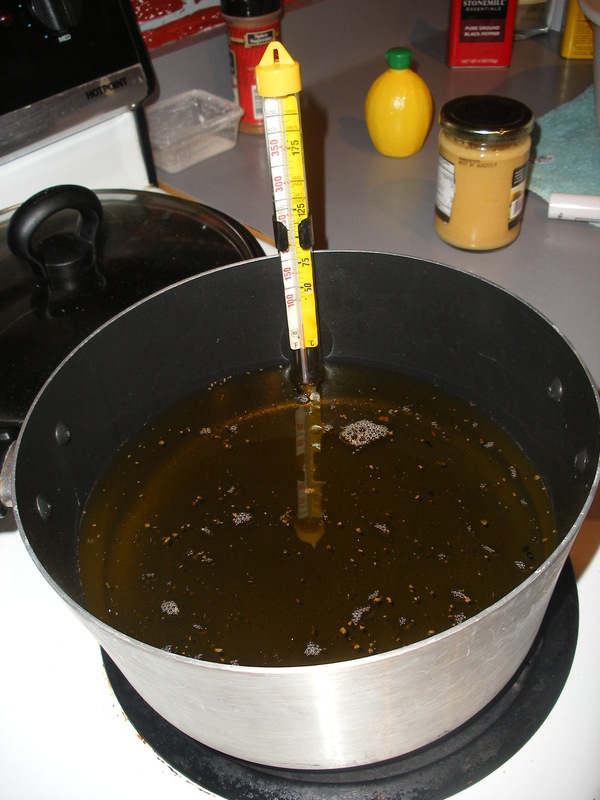 I always use my deep frying/candy thermometer. It’s gotten me through a lot. 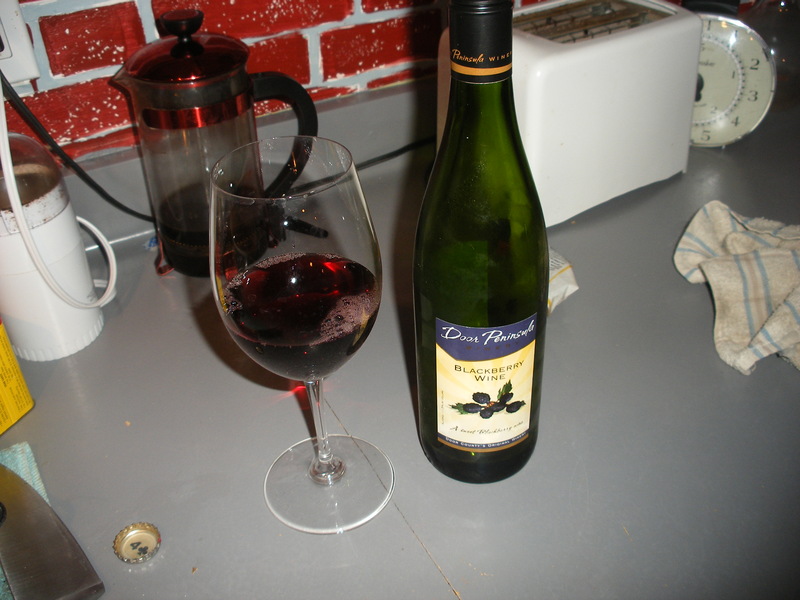 While that heated, I took a page from my favorite Pitmasters, and procured a lovely beverage. 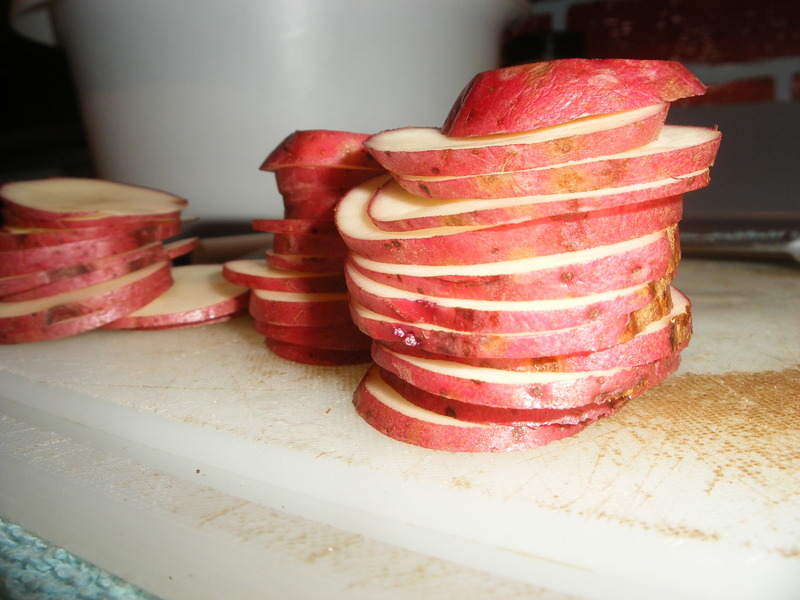 I also sliced up some potatoes, real thin. 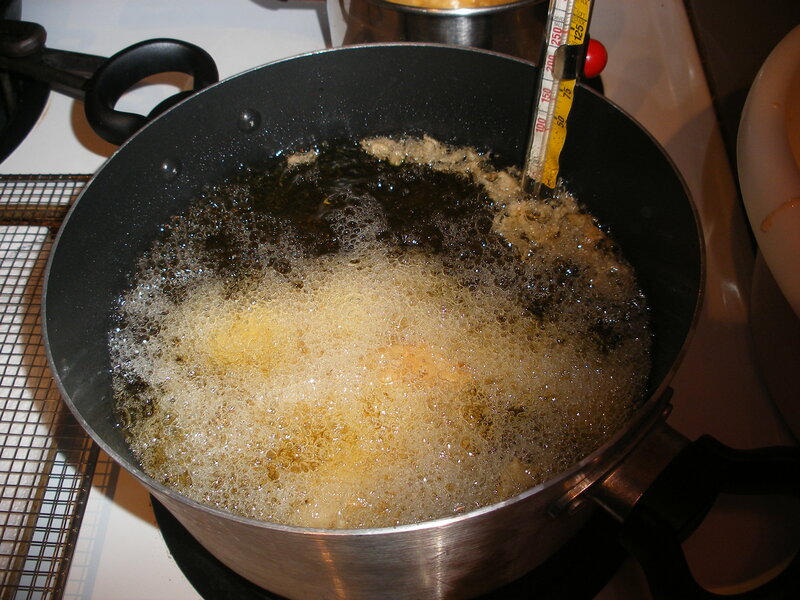 Once the oil reached temperature, I started putting in chips and battered fish alike. 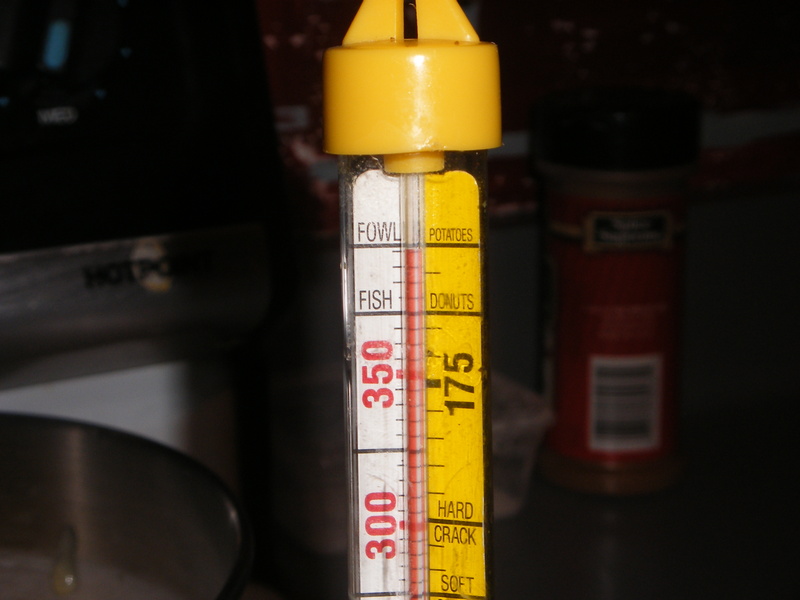 Right between Fish and Potatoes, as the cold fish strips would drop the oil temp significantly. 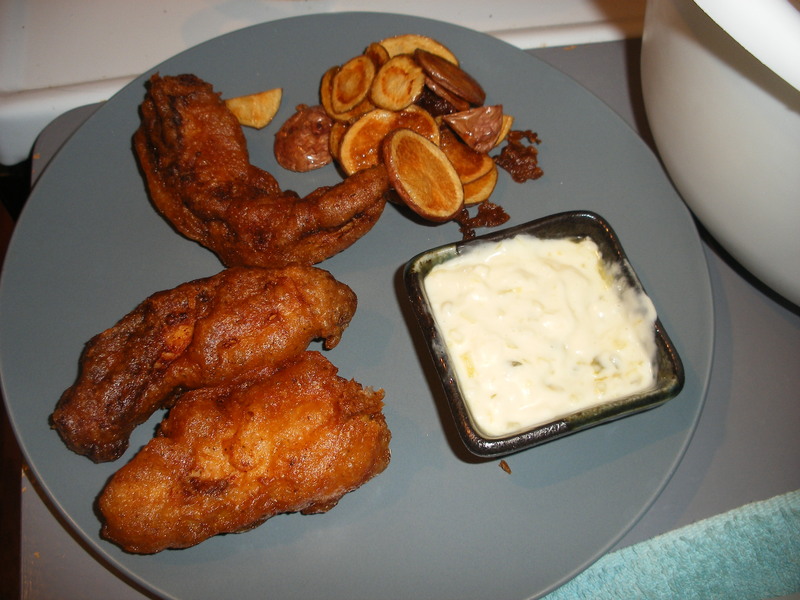 I fried things until they were a nice, deep, golden brown to ensure both doneness and crispiness. I whipped up some quick tartar sauce (it’s just mayo, sweet pickle relish, and lemon juice), shook Old Bay and apple cider vinegar on my chips, and dinner was served.